It has come to my attention that ASD doesn’t have any side dish recipes. Wait now. What are you saying? Are you sure? I thought about it, did a little digging, and sure enough, I stood guilty as charged. No sides! And since this is the time for confessions, here’s a big one: I don’t really even eat them. It’s true! I don’t! Am I alone in this? Now, I do fix sides. I have a family to feed, after all. 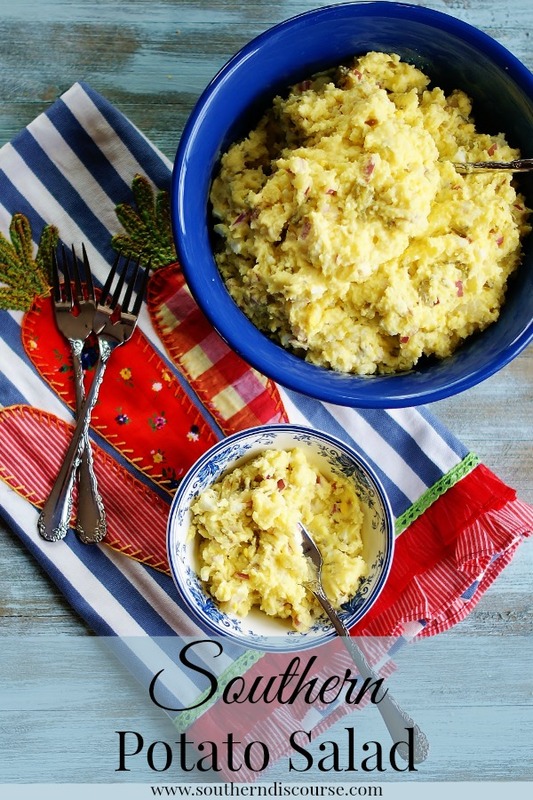 But there is this one that I love… Southern Potato Salad. Made with the family recipe below, it will make it onto my plate every time… and if that’s the case, it might even be the only thing I eat! 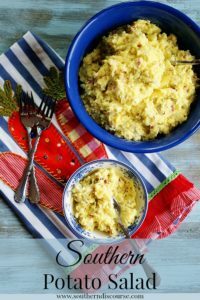 This family recipe for Southern Potato Salad makes the most light and fluffy potatoes this side of the Mississippi. Creamed with butter, mayo, mustard and loaded with red onion, pickle relish, and boiled eggs, it’s not short on flavor either. I’m sorry. I’ve got nothing. I have no idea why we did it that way. But we didn’t stay in the camp of hard kitchen labor for long. We decided that sweet pickle relish comes with ready-made diced sweet pickles (and so nicely diced too! So uniform!) and replete with a perfect nectar of pickle juice. So we ditched the extra dicing step, embraced efficiency over fancy knife skills and have never looked back. And as long as I’m confessing I will admit, I was 110% on board with that plan before I even knew it existed. This recipe starts out with some good old fashioned potato peeling. Not a job I ever look forward to, but a necessary evil. Peeled and quartered, our potatoes should enjoy a nice boiling bath with a tsp or so of salt until they are fork tender. 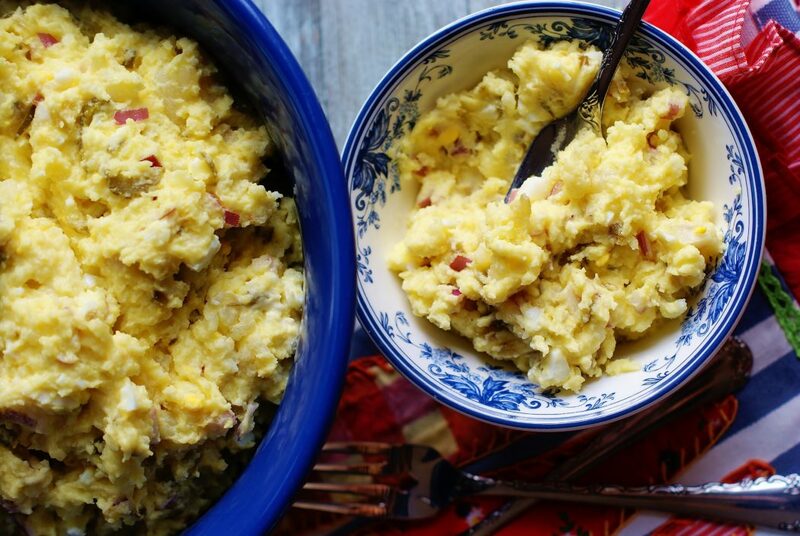 After our potatoes are boiled and drained, but still hot, it’s time to mash them or cream them, depending on how chunky your preference for potato salad is. I tend toward the more creamed side, so I use a handmixer to mix those potatoes and the butter right in the warm boiler I cooked them in. I don’t worry about getting all the lumps out. I like a few in there. Plus, the potatoes will break down more as we mix in all our ingredients. Speaking of all our ingredients, these guys steal the show. The potatoes in this salad are really just the vehicle to carry all this yumminess to our plates and ultimately onto our forks. I can’t wait! Load up your potatoes with diced onions, chopped boiled eggs, sweet pickle relish, mayo and mustard (exact measurements listed below) and just mix it all in. Whipped and mixed, your fluffy potato salad will take on a light yellow color because of the mustard. (A lot of times, versions of this potato salad are called mustard potato salad. 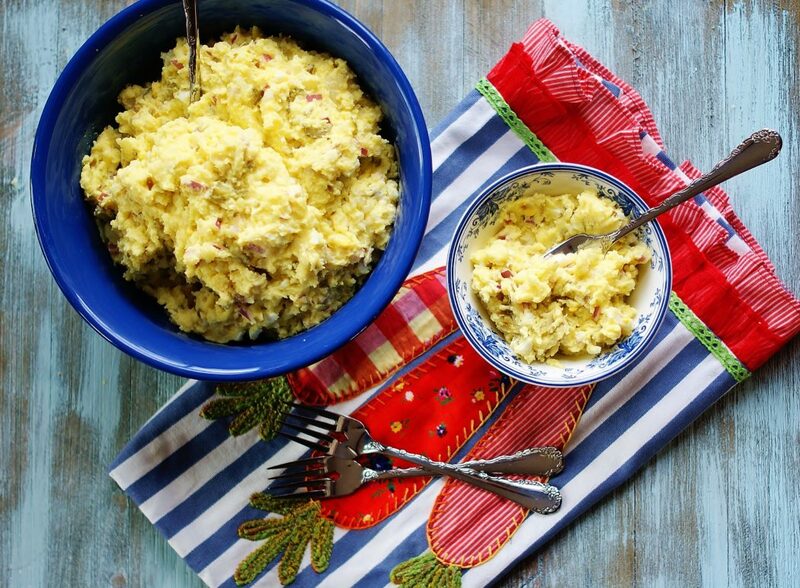 But real Southern Potato Salad always has mustard, so there’s no need to call that out in my book.) And the vinegar in both the mustard and the pickle relish round out the flavors in this picnic salad nicely. So there you have it! The perfect southern side dish. If you want to call it a side dish. After one bite, you might decide that you don’t want to eat anything else either. Need more southern inspiration? 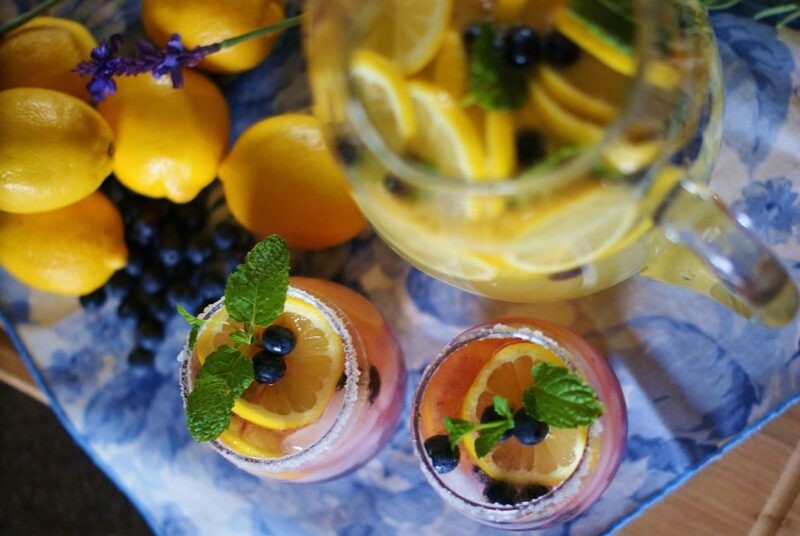 Try these bright and sunny ASD favorites! 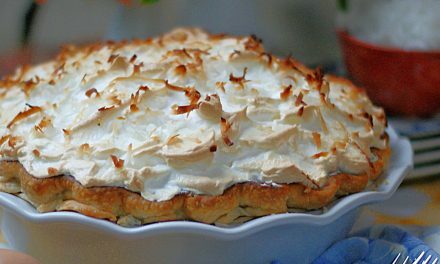 Check out this and other great recipes on Meal Plan Monday, Full Plate Thursday, Foodie Friday, and Weekend Potluck! 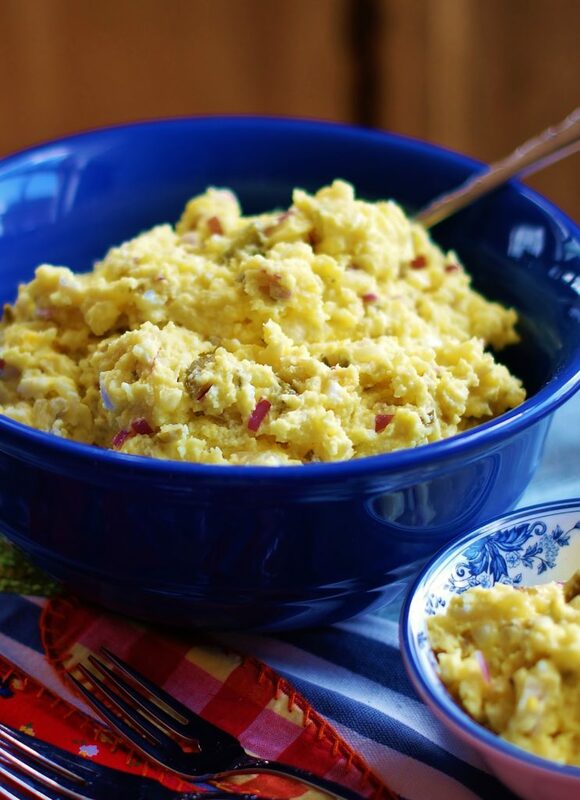 This Southern Potato Salad recipe is packed with red onions, pickles, and eggs. 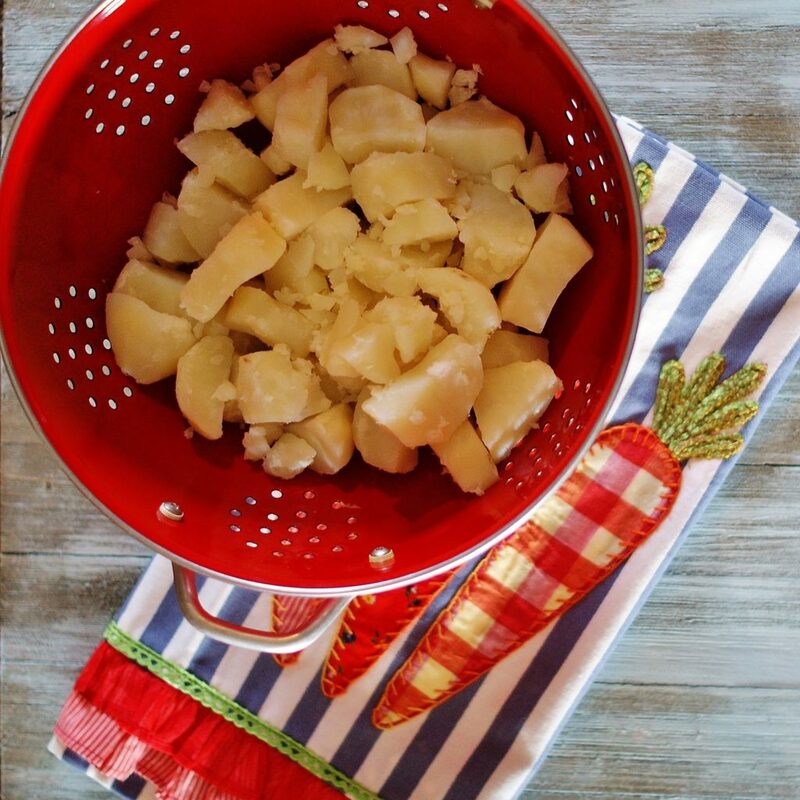 Boil washed, peeled and quartered potatoes in a large boiler for 20 minutes or until fork tender. 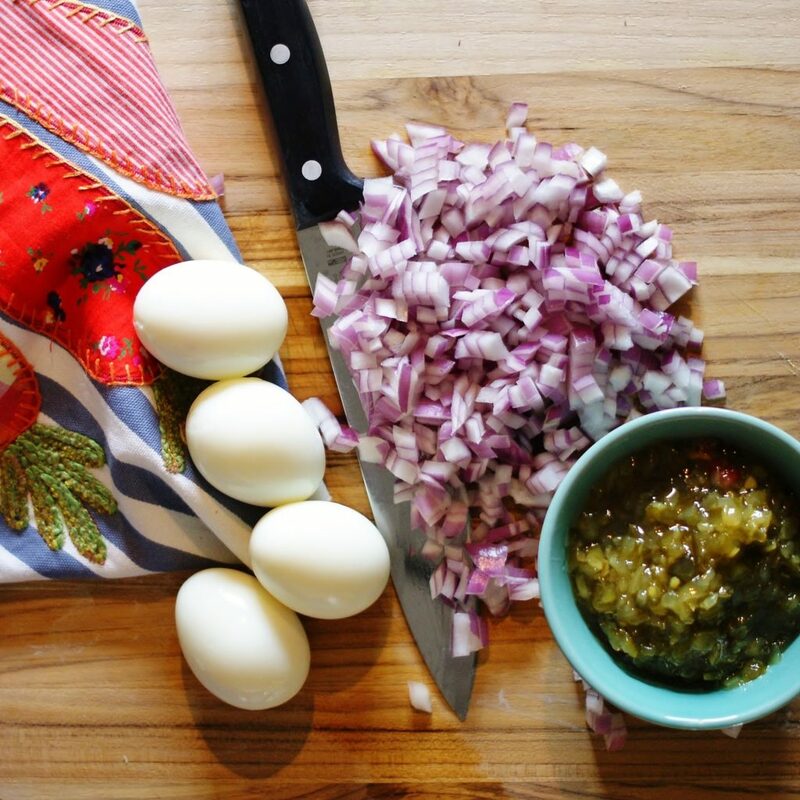 Mix in the chopped eggs, red onion, and relish. This will further break down the potatoes. Whip in 1 C mayo and all the mustard. If potato salad needs to be creamier, add the remaining 1/4 C mayo. Salt to taste. Put in a bowl to serve. Chill for one hour if chilled potato salad is preferred. 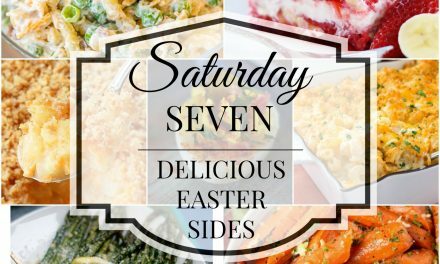 Made this tonight – a double batch – for Easter tomorrow and it’s fabulous! I can’t wait to taste it after it’s chilled! Home run, friend!!!! Yea!!! I hope the fam loves it too! It certainly is a favorite around here. 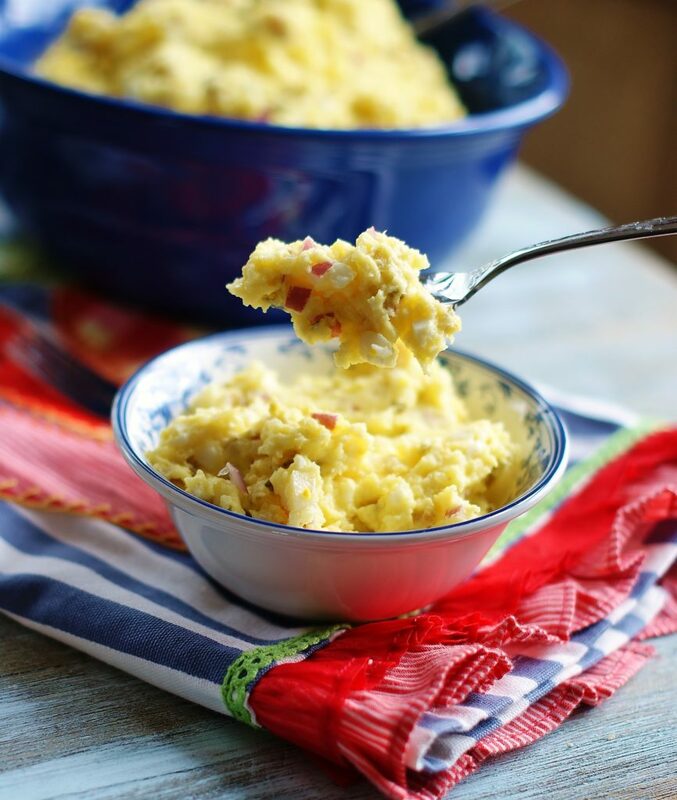 There is really nothing better than a great bowl of southern potato salad! Hope you had a wonderful weekend and thanks so much for sharing your special post with us at Full Plate Thursday! Have a great week and come back soon! Thank you, Miz Helen! I hope you had a wonderful Easter weekend!